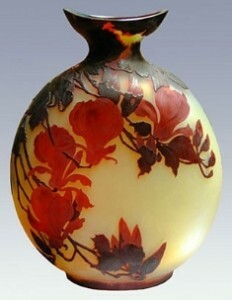 Galle realized the immense potentiality of the technique and began to use acid in conjunction with enameling in the production of his vessels. For these vessels the blank was covered in a protective ground on which the most delicate of continuous or random patters could be drawn with a pointed instrument. On placing the vessel into a bath of hydrofluoric acid, the drawn design was etched in the surface at a depth dependent on the length of time it was left in the acid bath.